If you haven’t seen some of the initiatives that IKEA has done, then you are losing out on tons of great creative work. As a matter of fact, IKEA is one of the few companies that have rolled out amazing work over the last couple of months. I think the recent one by IKEA Malaysia is quite interesting. 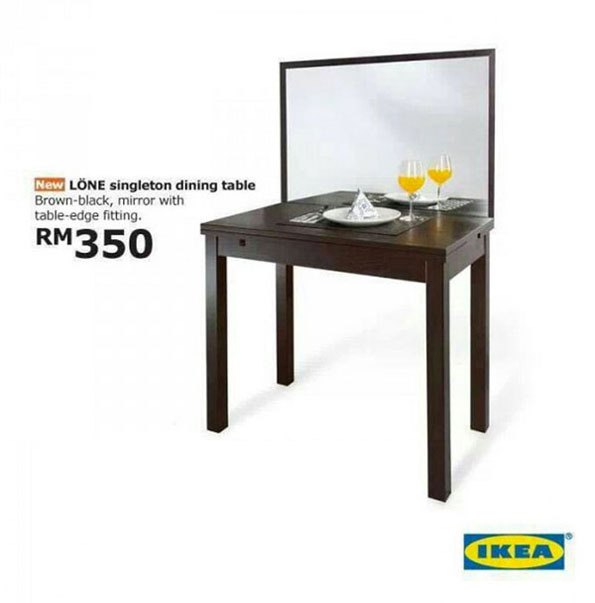 Teasing their audience, IKEA Malaysia came up with the “LÖNE Singleton Dining Table”. A dining table mounted with perpendicular mirror where one can glaze at their own reflection as they eat. What a great way to inject some humor into their furniture. Again, this could just be another April Fool’s joke.